Before we get into the recipe, look what I got in the mail from Hershey’s! Yep, that’s a Hershey’s® Cookie Headquarter Apron, one package of Hershey’s® Baking Melts Chocolates, one package of Hershey’s® Bits ‘o’ Brickle® Toffee Chips, one package of Hershey’s® Semi-Sweet Chocolate Chips, one package of Hershey’s® Kisses® Chocolates, one canister of Hershey’s® Cocoa, and one set of recipe cards featuring the core Hershey’s® holiday recipes. I know, it’s amazing. And I couldn’t wait to try out some of the chocolate, including Hershey’s new Baking Melts. The Baking Melts are these cute little discs that can be mixed into batters or even sandwiched between two cookies. The best thing about using them in this cookie recipe is that you get more chocolate in every bite. And how can you go wrong with more chocolate? Beat butter, granulated sugar, brown sugar and vanilla in large bowl until well blended. Add eggs, one at a time, beating well after each addition. Stir together flour, baking soda and salt; gradually beat into butter mixture. Stir in chocolate pieces and nuts. Drop by rounded tablespoons onto prepared cookie sheet. Bake 13 to 15 minutes or until golden brown. Cool 2 minutes; slide parchment paper and cookies to wire rack. Cool completely. 3 dozen cookies. 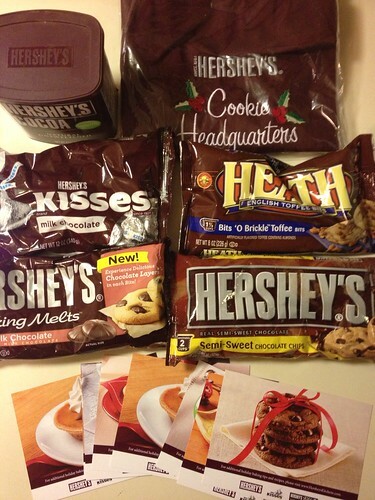 And because Hershey’s is so awesome, they’ve given me a holiday baking prize back to give away to one of you! Leave a comment below stating which Hershey’s product you are excited to bake with this holiday season. Hershey’s provided me with a holiday baking pack and will ship a second pack directly to a winner. Giveaway ends at 11:59 p.m. EST on Sunday, December 9, 2012. One winner will be selected at random shortly thereafter and contacted by email. Please note this giveaway is only open to residents of the U.S. I usually hunt for new things to bake with and I have not seen these baking melts yet so they are definitely tops on my list. We’ve already baked our first batches of cookies last weekend. We’re ready to start some more. I love baking with the toffee chips! I love the idea of the baking melts, especially because my family are card carrying chocoholics!! I’m very excited about the baking melts–I like the idea of them better than the chocolate chunks and they’re a nice change from chocolate chips. Ooh, I’d love to try those Hershey baking melts. I’m currently sifting through my favorite recipes to make Christmas goodie baskets for everyone, and I’d love to try some of my chocolate-filled cookies with them! I plan to try the baking melts. I just finished making several batches of cookies with the Toffee Chips–so delicious!! I really want to try the baking melts! Maybe in a peanut butter cookie? This is my first time seeing the baking melts. I’d love to experiment with those! I’d like to try the baking melts. I’ve definitely tried everything else! We love to bake and with my college girls coming home for winter break, I bet we’ll do some serious damage with the Hershey’s® Bits ‘o’ Brickle® Toffee Chips. Thanks for the suggestions! I’m pretty intrigued by those baking melts! Mmm I love those Heath bar bits, but I’m definitely curious about the Melts! I love toffee pieces in cookies and blondies! I am excited to try the baking melts. More chocolate is a good thing! The Bit O Brickle toffee pieces. I have a recipe that calls for these and it just gives that extra crunch and yumminess to the item,. I love all things Hershey. Last night I baked with giant Hershey bars, milk chocolate chips and Heath Bits. I can’t wait to try the Hershey Melts. I’m excited to try these baking chips! I am looking forward to experimenting with the toffee chips this holiday season! I love baking with the Heath English Toffee bits! I am extremely excited about the baking melts! I would love to be able to whip something delicious up with any of these Hershey products! Thanks for the awesome giveaway!!!!! I love their semi-sweet chocolate! Call me boring, but I will always love the semi-sweet chocolate chips. These would a great change from trying to chop up Heath Bars with a knife- I end up with pieces flying all over the place! I love their semi-sweet baking chips for pretty much everything. I’m excited to use their semi sweet chocolate chips. I have a salty sweet bark I make for holiday parties, and the chips are part of the recipe. 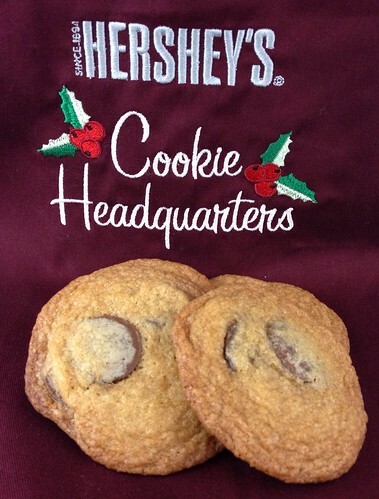 I would love to try Hershey’s baking melts in my holiday cookies this year. I’ve never used them before and they look delicious and fun. Thank you! The baking melts–I have a chocolate disk that I use for chocolate chip cookies, but it is outrageously expensive–curious if these will give the same wow factor. I would like to bake with their cocoa. Hershey’s semi-sweet chocolate chips in my chocolate fudge is a staple. I can’t wait to make this holiday treat for my family. I love the Heath chips!! I really want to use the baking melts! I would like to try baking melts!!!! !